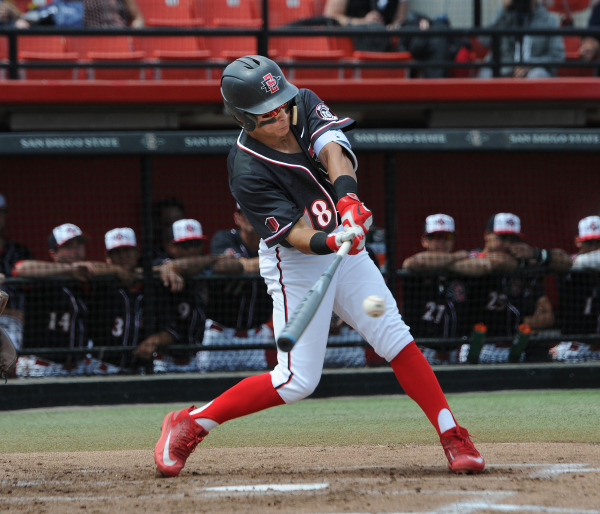 This year’s San Diego State baseball team is one of the best they’ve had in years. With an overall record of 29-13 and a conference record of 13-5, the team is succeeding expectations. The offense is explosive, led by Tyler Atkins who is batting a cool .370 with 11 bombs and 38 runs driven in. The pitching has improved incredibly since last season led by Brett Seeburger and Dominic Purpura, who are both on the list for the National Pitcher of the Year award. The team has had big wins over big time programs such as UCLA and USD who both consistently put out major league talent. They also have wins over two currently ranked teams by the Associated Press, #11 Long Beach State and #16 Cal State Fullerton. This team is clearly good enough to be ranked. They have an offensive that puts up big time numbers, and a pitching staff that has consistently been able to get the job done. Head Coach Mark Martinez has really put together a team that he has able to get the most out of. The question whoever remains; “why aren’t they getting the respect they deserve?” There are plenty of answers to this question, the most likely of which is probably that they play in the Mountain West, which is often considered a weak conference by AP voters. There also historically tends to be an East Coast bias against West Coast teams, which is also probably another rationale behind the lack of votes the team receives in the polls. It’s unfair for this team to fly under the radar the way they have been. They consistently give their all on the field and have shown that they can keep up with the big time programs they’ve played. The players and coaches deserve to be recognized for their on-field accomplishments. Although they may play in a “weaker” conference, the team has dominated conference opponents giving them an in-conference scoring margin of +67. It might be wrong that this team is unranked, but the one good thing that may come out of it is that the team will likely use it for motivation to continue beating their rivals. One thing we know for sure is that is the team is extremely good and if they keep this up, they may find themselves making a deep run in the College World Series.